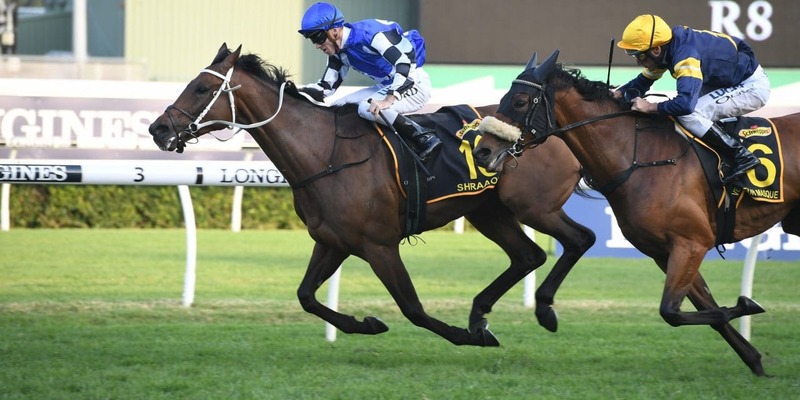 Twelve months ago Winx was the middle leg of a Waller clean sweep when winning her second Queen Elizabeth Stakes in between Unforgotten’s Australian Oaks and stable veteran Who Shot Thebarman in the Sydney Cup. Verry Elleegant kicked off the same sequence today with an easy Oaks win, Winx made it a century of Group One wins for her trainer as she brought the curtain down on her career with a third Queen Elizabeth and Irish-bred Shraaoh completed the same hat-trick in the Sydney Cup to begin Waller’s assault on his second century. Capitalising on the most economical passage in the 3200-metre race under Jay Ford, when he had to come around just one horse to lodge his bid, Shraaoh kept finding to hold out fellow Irish-bred, the Mike Moroney-trained Vengeur Masque. Kiwi racemares Glory Days and Rondinella were next across the line with solid performances. As she had done on the way to winning the Auckland Cup, Glory Days settled in the rear before Corey Brown let her slide forward into a perfect challenging position. She never stopped trying but was unable to pull back the pair of tough stayers inside her. Rondinella, who carried a kilogram over book weight, raced midfield outside Shraaoh and likewise was very brave even if she never quite looked like picking up the first two placegetters. Three autumn carnival placings, the most recent a brave second to Gallic Chieftain in last Saturday’s Chairman’s Handicap, set Shraaoh up for today’s big win. “He was identified from England by the people behind the horse and I thank them very much,” said Waller of the Sea The Stars six-year-old. “They’ve entrusted me to set him for it. He won first up over 2800 metres and that gave us the confidence to know he was capable of winning a race like this. Group One wins are nowhere near as common for winning rider Jay Ford as for Waller, and after scaling the heights a decade ago on freakish sprinter Takeover Target, today’s was his first in nine years. “It’s very satisfying for myself personally. I’ve ridden the rollercoaster a long time in Sydney,” Ford said. “I used to ride a very good horse and then he disappeared. Things have been up and down since then. “I’ve come close a few times since. I’m just thankful I can ride light and I do ride a lot for Chris. I had a couple of those things in my corner and we were fortunate enough that we got the job done.